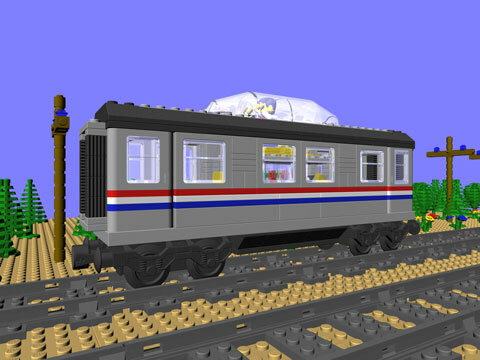 With the re-release of the Metroliner as a LEGO Legend it is now a little easier to build additional cars for this classic train. Parts are readily available again and the CTB-1116 Observation Car is the second in a series of Metroliner add-on cars. This model uses a number of pieces which may be hard to find, notably the light grey train doors with Metroliner stripes, the clear windscreen, and black 2×6 slopes. While these elements may not be readily available, you may be able to find them on BrickLink. The grey doors appeared in four sets, the clear windscreen in two sets and the black slopes in seven sets. Printed and bound instructions for CTB-1116 are available for purchase on Bricklink.